Earlier today I decided I was going to set myself a new challenge. I am going to level a tactical officer without running story line missions. Now at first this sounds difficult, but I think I have found some things to make it easier. Luce received her battlefield commission on stardate 89816.27. Immediately after her commision she headed out to start patrolling the galaxy. 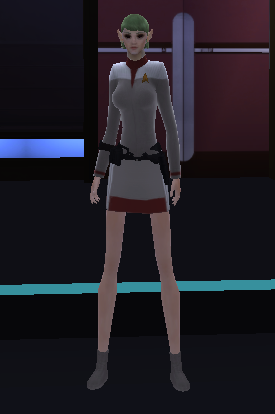 Always ready to say hello to other captains in Starfleet, she is on a quest for power and takes very little time off. She is exploring the galaxy looking for new equipment, techniques, and personnel to help her defeat the Borg. Thinking about this, the most logical plan is going to have to be active on multiple fronts. Duty officers are going to play a large part obviously, as they can give experience. Daily missions as well, these offer the chance for gaining dilithium along with experience. Player versus player as well. Now this one can be a pain from what I am told as there may not be a lot of people at my level doing it. I am going to try to do this in less than a month. Why a month you might ask? Well, its a nice round figure and leaves room for improvement for later challenges. This is going to be about finding areas of the game which I haven’t experienced yet. A lot of MMO’s tend to get stale very quickly with the whole grind your way up to max level then grind forever trying to get better gear approach. Star Trek online doesn’t seem to be as bad as most. I am sure there will be grinds along the way but currently it looks like there is a whole lot of different things to do. I am still planning this as I go, so any advice or tips are appreciated. And while I am at it, if you are interested in writing a post for this blog by all means either contact me here or in game @RainSlick. I will be doing progress reports at every rank increase. These will be a basic list of the missions that I have run, anything that I found to make it go faster etc. Currently at lieutenant (3) so nothing to report yet. Look for the first follow up post soon.